Cleaning your oven can be a real pain. 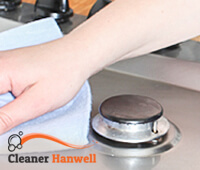 Unless you want to spend hours scrubbing and sponging, we suggest you give our Hanwell oven cleaning service a go. We’ll eradicate grease, lift dirt, remove stains and bad smells and leave you with a brand new oven. Our service is second to none, our prices are down to earth and our teams are unforgettable. We are all insured, qualified, vetted and skilled. We have relevant experience and skills to do a brilliant job. We encourage you to give our company a try. Dial this number whenever you please. 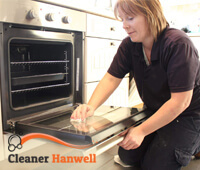 If you are looking for a complete, from-top-to-bottom oven cleaning service in Hanwell, you have come to the right place. We not only scrub the exterior of your appliance, but also remove grime and dirt on the inside and we even take out all removable parts to clean them more efficiently.With us you don’t have to worry about your oven. When we complete the cleaning session, your oven will be put back together and left as found. We guarantee it will be all clean and shiny. We will remove all stains, baked-on food and grime that cause bad smells and slow down your cooking process. It will look like the day you bought it. There are many reasons why you should trust us. First off, we have worked in this field for the past few years and we are fully acquainted with the entire process, the cleaning solutions and the methods. Second, we use environment-friendly cleaning equipment, so no worries, you are in safe hands. In addition, we have flexible working hours, so booking with our company is relatively easy. Last but not least, we work around Hanwell. Willing to make an appointment? Give us a call now.